Tweny-one species, where only one was previously known, are reported as a result of the research which applied the latest DNA-taxonomy methodology to mollusc specimens collected from the central Pacific Clarion Clipperton Zone (CCZ) in 2013. They are all described in the open access journal ZooKeys. Among the discoveries is a monoplacophoran mollusc species regarded as a ‘living fossil’, since it is one the ancestors of all molluscs. This is the first DNA to be collected from this species and the first record of it from the CCZ mining exploration zone – a vast 5-million-km² region of the central Pacific that is regulated for seabed mining by the International Seabed Authority. “Despite over 100 survey expeditions to the region over 40 years of mineral prospecting, there has been almost no taxonomy done on the molluscs from this area,” says lead author Dr Helena Wiklund of the The Natural History Museum in London (NHM). 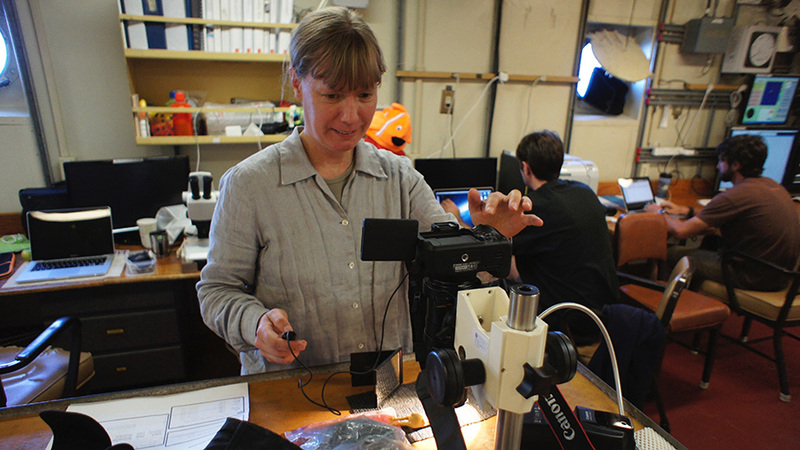 Dr Wiklund undertook a comprehensive DNA-based study of the molluscs to confirm species identities and make data available for future taxonomic study. This was coupled with the expertise of the NHM’s Dr John Taylor, who led the morphological work. The molluscs were found in samples taken on and in the mud surrounding the potato-sized polymetallic nodules that are present in high abundance across the CCZ. These nodules are the target for potential deep-sea mining being rich in cobalt, copper, nickel, manganese and other valuable minerals. The data are vital for the future environmental regulation of deep-sea mining, but have also revealed surprising patterns. “I was amazed to discover that specimens collected during the 19th century by HMS Challenger were probably the same as ours over a range of 7000 km, but that data lodged on genetic databases from closer but shallower depths is likely to be from a different species,” comments Dr Thomas Dahlgren, population geneticist at Uni Research, Norway and University of Gothenburg, Sweden, who studied in detail a species called Nucula profundorum. “Our efforts are now focussing on studying the DNA from many more samples of this species to examine connectivity and potential resilience to deep-sea mining,” he added. “It is a simple truth that we cannot move forward on regulatory approval for deep-sea mining without fundamental baseline data on what animals actually live in these regions,” says Principal Investigator of the NHM Deep-sea Systematics and Ecology Research Group, Dr Adrian Glover. Creating a library of archived DNA-sequenced samples from known species allows for the future possibility of using the latest environmental DNA (eDNA) methods to ‘search’ for these species using just tiny samples of mud or seawater. “Its akin to forensic science’, says Dr Glover. “You can’t use eDNA to find the criminals or species unless you have a library of information to compare them too”. All data and specimens from the study have been lodged at the NHM and online repositories to make them accessible for future study. Of particular importance are the frozen tissue collections, which are housed in the state-of-the-art Molecular Collections Facility at the NHM and available for loan or further DNA work.